An oversized waffle cone. Photo by Keith Syvinski | SXC. This is Page 5 of a five-page glossary of the different types of ice cream. This page explains terms such as sherbet, sorbet, spumoni and tartufo. See many more food glossaries with your favorite foods. The word for “half cold” in Italian, it refers to a class of semi-frozen desserts—semi-frozen custards, ice cream cakes and tarts. Frozen soufflé is the English term. It may look like ice cream but it isn’t ice cream per se. Rather, it is more of a frozen mousse, produced by combining equal parts of ice cream and whipped cream. 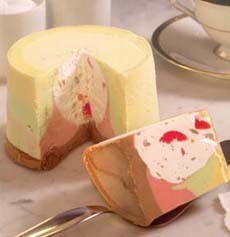 Semifreddo. Here’s the recipe, from Pom Wonderful. Shave ice. Photo courtesy MySipShop.com. 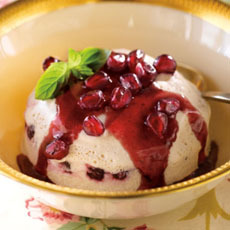 A water and fruit-based product like sorbet, with some milk added to provide creaminess. By law, sherbet can contain no more than 2% milkfat, and ranges from 1% to 2%. The milk makes it slightly heavier product than sorbet (see below). Snow cones: shaved ice flavored with syrups. Photo courtesy McCormick. Interestingly, snow cones are the descendents of the original “ice cream,” which was snow flavored with fruit juice, created 4,000 years ago by the Chinese and learned through trade routes by the Persians 2,500 years ago. See the History Of Ice Cream. 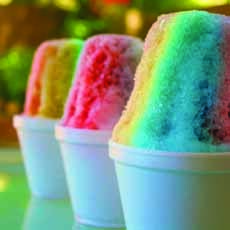 Snow ice is a Taiwanese invention that has taken root in Hawaii. It requires a special machine that shaves the pre-flavored ice into ribbons. Some flavors are water-based and vegan, others have some added milk. Toppings are part of the fun: Colorful garnishes include azuki beans, jellies, mochi balls, tapioca pearls and a sauce of sweetened condensed milk. In addition to classic and exotic sweet flavors, there are also savory flavors such as pickle, sriracha and watercress. Here’s more about snow ice. 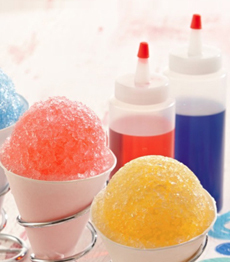 Shaved ice or snow cones consist of finely crushed ice flavored by pumps of colorful syrup. 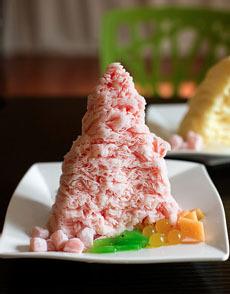 Shaved snow/snow ice is like a hybrid of shaved ice and ice cream. It is already flavored (no syrups) and has a creamy consistency that pairs well with toppings. Watermelon shaved ice with toppings. Photo courtesy Hannah Kaminsky | BittersweetBlog.com. A frozen dessert generally made from fruit purée or fruit juice; it can incorporate other flavorings including herbs and liqueurs. Sorbet is the French word; the Italian word is sorbetto. Unlike sherbet, sorbet technically contains no milk; however, in some regions of Italy (and in some U.S. recipes as well), milk or cream is used and and there is no separate word to distinguish it (so if you steer clear of milk products, read the label or ask the waiter). Some sorbet recipes also use egg whites. Whereas gelato traces its roots “only” as far back as Renaissance Italy, sorbet dates to ancient Roman times. In the first century C.E., Emperor Nero, who had a hankering for the cold, sweet stuff, had runners along the Appian Way pass buckets of snow from the mountains, hand over hand, until it reached his banquet hall, where it was mixed with honey and wine. Pre-dating Nero, the Chinese have made concoctions from snow, juice and fruit pulp for several thousand years. 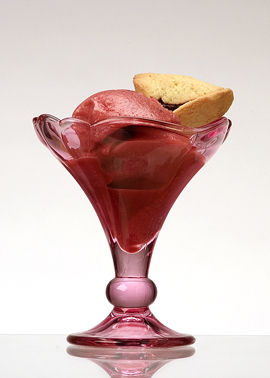 Raspberry sorbet with a cookie garnish. Line a large loaf pan with overlapping pieces of plastic wrap, leaving an overhang on all sides. Soften the ice cream one flavor at a time, until it can be spread in the pan. Cover pan with plastic wrap and freeze about 30 minutes; repeat with the other two flavors. In-between layers, you can add candied fruit, maraschino cherries and/or chopped pistachio nuts. Return to freezer until ready to use; slice and serve. The classic ice cream cone, differentiated from the cake cone (or wafer cone) by its pure conical shape, dark color, crunchiness and brown sugar flavor. 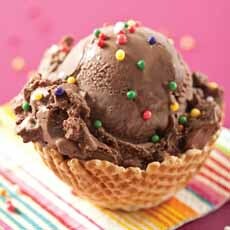 Sugar cones can be found in chocolate as well (made by adding cocoa to the batter) and decorated—dipped in melted chocolate and/or garnished with chocolate chips, coconut, candies, coconut and other confections. 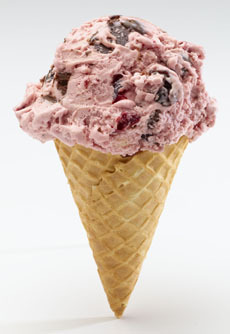 Sugar cone with blueberry ice cream. Photo courtesy Wisconsin Milk Marketing Board. A name invented in America (although exactly where is disputed—see The History Of Ice Cream) for a dish of one or more scoops of ice cream topped with sauce or syrup (generally butterscotch, caramel, chocolate, marshmallow creme or strawberry). Chopped nuts and whipped cream are generally added and a maraschino cherry is placed on top. There are endless variations on the sundae, incorporating fruit, cookies, candy, cake, peanut butter sauce, sprinkles/jimmies, and ingredients too numerous to list. 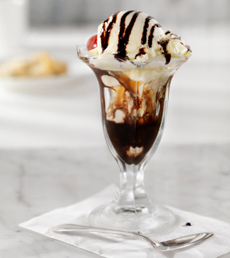 A chocolate sundae in a classic sundae dish. Photo by Lauri Patterson | IST. An ice cream novelty. 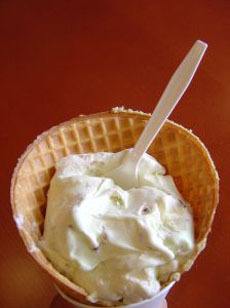 A scoop of ice cream, typically vanilla, is packed into a sugar cone, covered in chocolate and topped with chopped nuts. Sundae cone. Photo courtesy Wisconsin Milk Marketing Board. The Italian word for truffle, tartufo is a ball of vanilla ice cream, often with a cherry and nuts in the center, enrobed in chocolate. The word is often misspelled in America as “tartuffo.” The first chocolate tartufos (truffles) were chocolate candies, round balls of ganache created just after the French revolution (1799) by French chefs, and were initially given as Christmas gifts. They were intended to resemble the precious Périgord truffles, hunted in forests. The ice cream version appeared around the Victorian era (1837-1901), when the molding of ice cream into flowers, fruits, and other shapes became popular. The coating should be chocolate cookie crumbs or mini chips, rather than enrobing in smooth chocolate, in order to look like the namesake truffles. 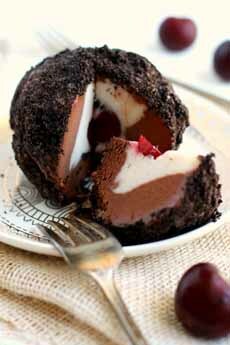 Tartufo. Here’s as recipe from The Pretty Bee. While some people confuse the terms “waffle cone” and “sugar cone”—both have waffle patterns—a waffle cone is the original rolled cone. You can see where the edges overlap. There are other key differences. 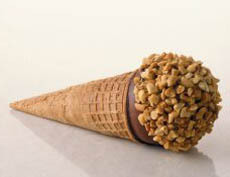 First, waffle cones are made with brown sugar and are darker in color as well as more intense in flavor. They are harder as well. Sugar cones are made in molds and are softer and less flavorful, with a flaky texture. Toward the end of the 20th century, “supersize me” waffle cones were introduced that are twice the size of the original (see photo at top of page). Waffle cones can be plain or decorated with a chocolate dip, chocolate chips, coconut, candies, coconut and other confections. 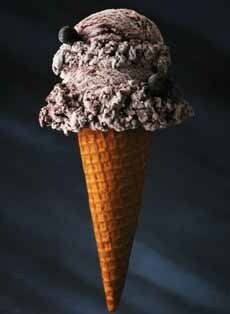 See photo of waffle cone at top of page. The history of the ice cream cone. See also cone cup and cake cone. A waffle cone, twice the size of a standard sugar cone. Photo courtesy Ruby et Violette. 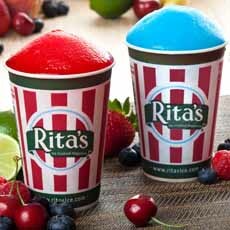 A frozen dessert similar to Italian Ice, but often found in a wider variety of flavors. Waffle cup sundae. Photo courtesy Scoop: 125 Specialty Ice Creams. Water ices. Photo courtesy Imprinsic.com.